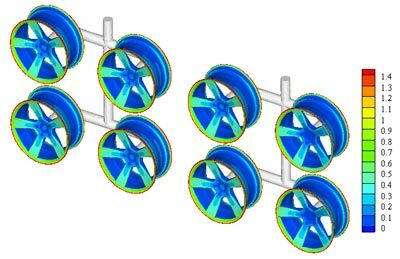 ..: Case Studies - Simulation of a Decorative Cr Plating Process for a Rack of Wheels:.. Decorative Cr plating processes produce highly non-uniform current density and layer thickness distributions. Rack design by trial-and-error will often require huge labour costs, mainly due to the large number of adjustable configuration parameters: number of parts in the rack, orientation and position of the parts, shape, dimension and position of screens and/or current thieves, etc. An entire trial and error run (rack design - rack manufacturing - plating - measuring layer thickness distributions on some parts in the rack) might take easily one week or longer. In contrast, defining the rack configuration from figure 1 in the SolidWorks CAD environment takes only a few hours, with another 1 or 2 hours to compute the resulting layer thickness distribution (figure 2) with Elsyca PlatingMaster. Hence, using Elsyca PlatingMaster will dramatically reduce the number of experimental trial and error runs, saving precious money and time. Figure 1: Rack configuration with load of 8 wheels and surrounding plating tank walls; Top surface represents the electrolyte level, front and back surface represent anode baskets. 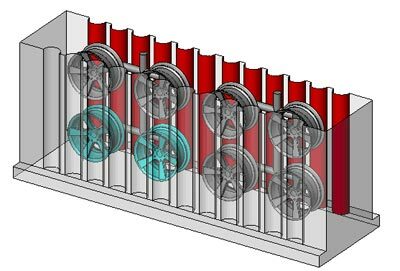 Figure 2: Layer thickness distribution (in micron) over all wheels in the rack.